Friday December 29th 1893 I ironed this morning and did my other work. I spent the whole afternoon doing mending. Will was busy about town the roads are too rough to haul wood. I worked on my mat in the evening and he read a book. Saturday December 30th 1893 I was busy with the work all forenoon. Mother came over. We spent the afternoon here. Mary and Jennie Woolf came for awhile. When Mother went home I walked as far as the bridge with her. I worked on my mat afternoon and evening. Elmer Anderson took supper with us he expected Willie & Mary from Delavan but they did not come. Will made a lease with Mr Hedges today taking his farm three years. Anna Edwards went to Chicago tonight. 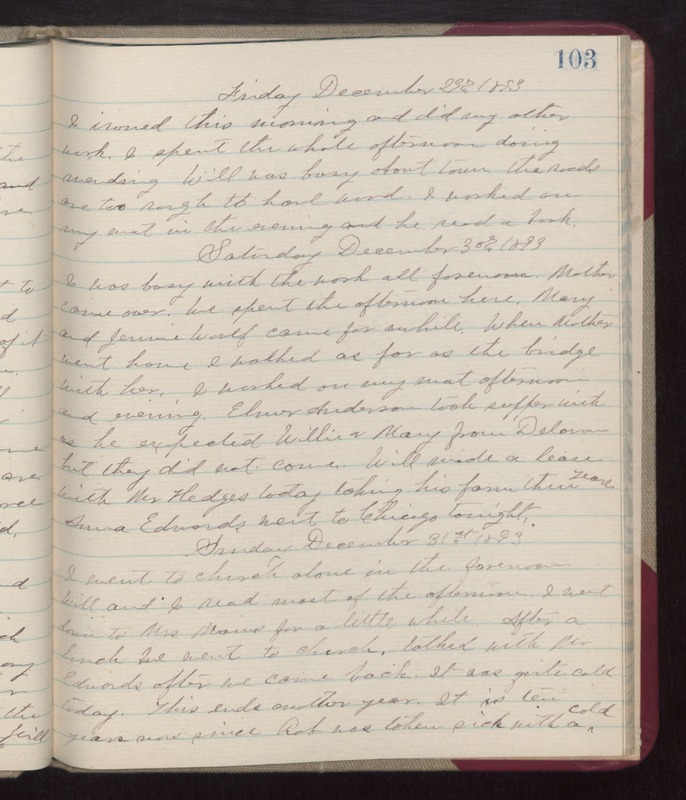 Sunday December 31st 1893 I went to church alone in the forenoon Will and i read most of the afternoon. I went down to Mrs Mains for a little while. After a lunch we went to church. Talked with Mr Edwards after we came back. It was quite cold today. Thus ends another year. It is ten years now since Rob was taken sick with a cold.